Yuzuru Hanyu of Japan performs his long program at 2016 NHK Trophy. Japanese skating hero Yuzuru Hanyu delivered under pressure in front of an enthusiastic home crowd and won gold, scoring 301.47 points on the way at 2016 NHK Trophy. USA’s Nathan Chen secured the silver and a spot in the Grand Prix Final together with Hanyu. The bronze was up for grabs and Keiji Tanaka of Japan was the one who pocketed it. 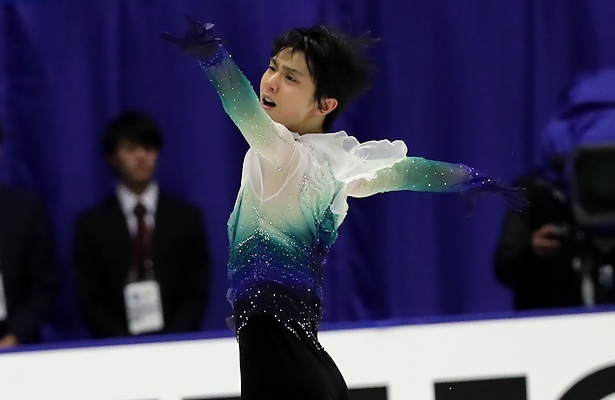 Hanyu was off to a good start in his “Prince” short program, landing the quad Salchow-triple toe, triple Axel, and a quad loop, albeit with a step out. The Olympic champion led by almost 16 points over Chen. “In my short program, I really want to feel like a rock star, like Prince,” Hanyu said. In Japan, he is definitely a rock star. In his long program to “Hope and Legacy” by Joe Hisaishi, the 2016 World silver medalist nailed three quads: loop, Salchow and a toe loop and only missed the second quad Salchow. His triple Axels were also excellent and Hanyu was awarded a new season’s best. He broke the three-hundred barrier again with 301.47 for first place. Chen missed his quadruple Lutz in both programs, but landed the quad flip twice in combination and also two quad toes in the free skating, stepping out on the first one. The triple Axel is probably his weakest jump; he stumbled badly in the short, but hit a shaky one in the long. Chen and coach Rafael Arutyunyan had decided to take out the fifth quad, a Salchow. Tanaka stood in third following the short program and then he held it together in his long to Fellini movie soundtracks, finishing third overall (248.44). He landed two quad Salchows (touched down on the first one) and six clean triples. Israel’s European silver medalist Alexei Bychenko had a few stumbles here and there, but managed to pull up from seventh to fourth place (229.87). Mikhail Kolyada of Russia did not skate up to his potential and made errors on several jumps, most notably falling on the quad Lutz that he attempted for the first time in competition and the quad toe plus popping an Axel. He finished fifth (225.69). Deniss Vasiljevs of Latvia, who is now coached by Stéphane Lambiel, gave an inspiring and clean performance to “Four Seasons” in the free skating with eight triples to rise from tenth to sixth place (223.73). In the short, he lost points as he underrotated the flip and reduced his combination to triple Lutz-double toe. USA’s Jason Brown blew his chance for the Grand Prix Final with two mediocre performances. Not only did he miss his quad attempt, but he also struggled with the triple Axel and doubled a few jumps in the free skating. He finished seventh (218.47).